You sit in front of the funny-looking 18-ton steam locomotive as it pushes your antique railcar up the 37% grade of Mount Washington to the summit, famous for extreme weather. 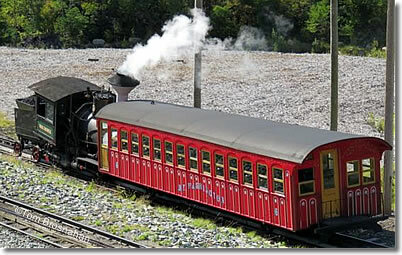 A train that is propelled up a steep slope not by power to its wheels (which would slip and slide on the 37% grade) but by a big-toothed cog wheel underneath the engine. 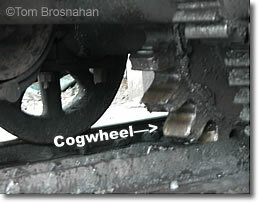 The teeth in the cog wheel fit into a track between the rails that has holes for the cog's teeth. Tooth by tooth, the cog and track take the locomotive and its one passenger car up the steep slope. It's great fun to ride the rails to the summit of Mount Washington, walk around for a bit, have a drink or light meal in the visitor center at the summit, then descend. Some days there is not much of a view because of Mount Washington's extreme weather, but if you are so lucky as to ascend on a clear day, the panorama is spectacular. The cog railway base station, where you board the train, is 6 miles (10 km) northeast of the Base Station Restaurant in Fabyan off US Route 302 east of Twin Mountain NH (map). The turn off US 302 is two miles northwest of Bretton Woods. 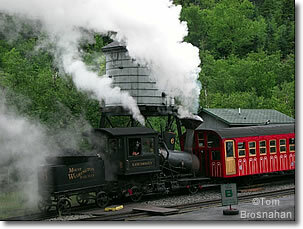 Your Cog Railway ticket entitles you to free admission at the Observatory at the summit of Mount Washington. On the return trip from the summit to the base station, the locomotive goes down first, staying a few feet in front of the passenger car as a safety, but the car's descent is controlled by a brakeman who stands in the car at its lower end and turns several brake wheels to increase or retard the car's speed depending upon the slope of the track. As on the ascent, the car is not connected to the locomotive at all. 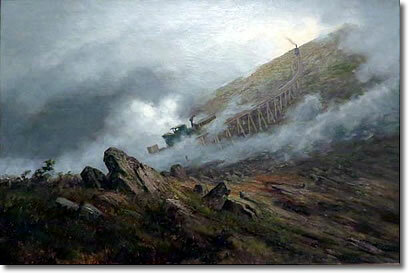 Cog Railway, by Edward Hill (1884). 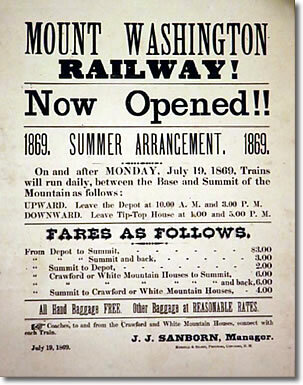 The Mount Washington Cog Railway was a difficult construction project and an engineering marvel. In 1852 investor Sylvester Marsh got lost on Mount Washington and wanted an easy way to get down, so he invented the world's first cog railway. Lots of people laughed at Marsh as a crazy dreamer, but on July 3, 1869, "Old Peppersass," a primitive steam engine with a vertical boiler, toiled the 3.1 miles (5 km) up the side of the mountain to the summit. Marsh's dream had come true 17 years after he got lost on the mountain. Later refinements reoriented the locomotive's boiler to a tilted-horizontal position (so that it would be more perfectly horizontal as it climbed the steep slope), but the engineering of the railway is essentially the same as in the beginning: a steam-powered locomotive pushes one passenger car—which is not connected to the locomotive—up the mountain. The major difference is that today the locomotive may be powered by biodiesel fuel rather than by a ton of dirty coal as in years past. In September 2008 the century-old locomotives began the conversion to biodiesel power in order to eliminate the gigantic plumes of dark, dirty coal smoke that belched from the boilers on ascent. Cleaner-burning fuel eliminates a noxious pollutant from the White Mountains' refreshing air, but with the conversion a bit of living 19th-century technological history ends forever. 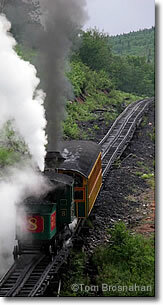 Above, a locomotive gets up steam. Below, the cog and track. Above, the cogwheel that drives the train.